I've been running err... rather trail running for about 2 years now, and up until the past few months, I've never really had a problem with blisters except for really long runs/races. (We're talking 50k or more). This year though has been a whole different ball game starting with my training leading up to the Barkley Fall Classic. Back in September I had formed some blisters prior to the Rock & Root 30 which was my last tune up run for BFC. I assume it was a combination of wool socks and wet feet during the hot and humid September days on the trail. After BFC the few blisters were pretty gnarly and nasty. What was a guy to do once the feet healed after BFC and it was time to get back to training for my next ultra trail race, Norris Dam Hard Trail Race 50k? Enter Run Goo by Foot Kinetics. This stuff is awesome. Before setting out for my long training runs, I'd rub this stuff all over my toes and the balls of my feet. It didn't matter, 10 miles, 20 miles, 50k; I haven't had a blister on my toes since. The combination of lanolin, natural jojoba, sunflower and mimosa waxes help to create a friction barrier between the socks and skin of your feet. 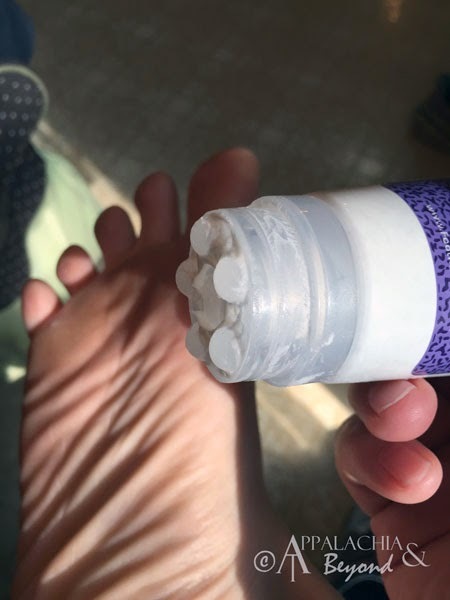 This helps to prevent blisters, callouses, you name it. I even put some in other usual chaffing places and I've not chaffed once. Not even during my last 50k where it was cold, wet and miserable. Run Goo comes in either a 5.5oz or 3oz. tube and can be purchased at Foot Kinetics website or on Amazon for $16.99 for the larger size or $9.99 for the smaller size. So if you suffer from blisters or other common foot/skin issues from running, hiking, etc., do yourself a favor and get some Run Goo. They sell other formulas as well for hiking and walking. P.S. Works in wet and dry conditions. Disclaimer: Tim received Run Goo for review purposes only and is not being compensated by Foot Kinetics for this review. The opinions expressed above are Tim and Robin's independent thoughts and experiences.